There are very few oldtime bricks and mortar Funhouses left, but I have semi-fond memories of the one that used to be at the Santa Cruz Beach Boardwalk. Basically the ‘rents would pay one very low entrance fee per kid and launch us into unsupervised orbit whilst they went and had a moment or two – helicopter parenting having not been invented yet. 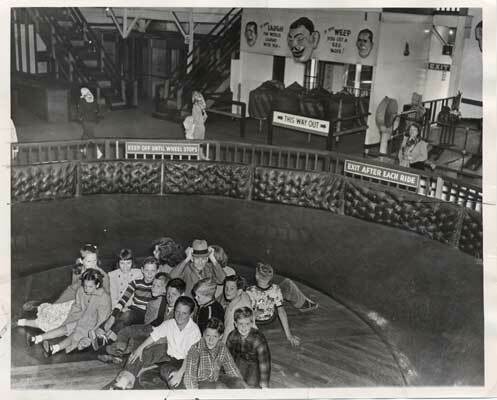 Happily inside, we scattered onto the bucking walkways, rolling barrels, giant slides, funhouse mirrors and, the trickiest of all, the “spinning platter,” or whatever you call it, seen above at Playland at the Beach in San Francisco because I can’t find a photo from Santa Cruz. (If you have one in the family album, please send it my way and I just might update this post with it!) Everyone looks so happy in the photo, but it’s misleading because they aren’t spinning yet. While other Funhouse activities presented reasonably delightful challenges, this horizontal turntable was just a plain unwinnable floorburn-installing monster. It came down to whoever got to EXACT CENTER first in the mad scramble to load in. Everyone else besides Numero Uno was already doomed. And, truth to tell, maybe some of us weren’t expecting anything else but being wildly flung off. If this whole Funhouse thing is out of your realm of experience, here’s a video from Luna Park in Australia – with adults and lots more padding. Either way, it leads to my point today. Pretty much the best way to work with centrifugal force is to be at the center and command it, like a Numero Uno kid. (But I like how the Aussie lads in the video found linked triads and quartets of stability at the center. It gives me hope for world peace.) In ceramics that means finding your centering bliss on a wheelhead and expanding the clay evenly at the right speed from there. A vertical lathe, I’ve heard it called. I’ve done enough wheel throwing and found it un-mesmerizing for me because it only led to perfectly round pieces which I promptly altered. I craved organic out-of-roundness from the get-go, so I soon removed the intervening machine. Eccentric lil’ me. Don’t get me wrong, I do love round wheel-thrown pottery. I just don’t want to make it. What fascinates me more is the making of roundish work. Out-of-round, but casually referencing round. Not trying too hard to be round or not round, but to just be in a dynamic eccentric stasis. Yeah, I don’t quite know what that is and I have tried, believe me, to quantify it, to my detriment. All I know is I know it when I see it. Sometimes it comes down to millimeters between doing eccentric right and doing it wrong. Ignore that at your peril. And of course there’s the second meaning to the word eccentric . The one having to do with behavior, character, opinions and such. Of that, too, I seek the abnormal, out-of-the-semi-round box. But wait, is that DEVIANT BEHAVIOR? Or just a great thing for an artist to do? I am certainly outwardly conventional, sane and sober in my dress, speech, life choices and such. But in my art? After the past year of seachange, I now feel it is my sacred idiosyncratic duty to express my eccentricity to the fullest. To step away from the metaphoric center and be utterly and beautifully flung. That is the sole litmus test for all the new bodies of work I am currently creating, anyhow, and it sure is more interesting and joyful. There’s a third facet to physical and creative eccentricity’s behavior. To illustrate it, my sister is letting me tell her story about another carny ride, The Rotor, which makes use of centrifugal force to hold bodies in rather than to fling them off. (Rather like what a potter’s hands do, especially when collaring in the narrow neck of a vase or bottle.) Basically riders stand up against a tall and bare cylindrical wall which then begins to rotate faster and faster. When the spinning gets to 3g force, the floor lowers, leaving everyone plastered in place against the wall. Theoretically. The metaphor here comes from my sis’s still-mystifying experience of NOT staying plastered. To her mortification, when the floor dropped she kept sliding and sinking until her head was at the level of the other riders’ feet, her long skirt scootching embarrassingly upward. Best we can figure decades later is that friction comes into play in conjunction with the centrifugal force, and she didn’t have enough of it. The takeaway is that not only is the spinning force to be acknowledged, but that it benefits from primo application of one’s skills – just the right touches of friction, really – to bring about the right amount of eccentricity. The hands and heart of the maker working sensitively with physical matter, doing the right dance moves at the right time. -Liz Crain, who tried to find a quote from Henry Miller’s book “To Paint is to Love Again” about making one’s own work and nothing else. He spoke charmingly of making as horsey a horse as he could. And his horses looked endearingly like two people in a horse costume. Maybe she’ll have the quote for you next time when she wants to talk about Wabi-Sabi. Until then, she’s looking for a place to make some bad Spin Art. Nice essay. I recall the fun houses of Santa Cruz and San Francisco with fondness and some melancholy. My mom was the original helicopter mom and was afraid that most of these contraption of would eat me alive so I was limited to the slides. I had fun but wished for more adventure. I once went on the Rotor and that was not that much fun. I didn’t slide down the face of the ride, but got quite a headache. Evidently your sister had a dress with a low coefficient of friction so that the vector of gravity overcome friction plus rotational forces. Damien Hearst, the British unartist (my opinion) has dabbled in centrifugal force art Perhaps he was bored of pickling animal. Hi Bob! I bet there are a lot of un-fun stories about Funhouses and carny rides. Even that slide was kind of jarring and abrupt! I get whiplash on nearly everything now, so even watching kinda hurts! Guess I had a higher pain threshold then. And thanks for confirming our suspicions on “The Rotor Misadventure.” I will make sure my sis sees your comment. I agree with you completely about Damien Hirst and while researching Spin Art I happened across his versions. Not impressed. I used to have a Spin Art app on my phone – think I will go try to find it again.